Located midway between Syracuse and Binghamton, Cortland County is rich in rural beauty, small town living, art, culture, outdoor adventure… and snow. This is the place to ski, snowboard, snowshoe, and hike through a veritable winter wonderland. Hit the slopes at four premier ski resorts – Greek Peak Mountain Resort, Toggenburg Mountain, Labrador Mountain, and Song Mountain Resort. Between the four, you’ll find almost 100 trails of varying difficulty to try, peppered with glade runs, moguls, terrain parks, wooded hills and open trails. In the summer, branch out to Lime Hollow Center for Environment & Culture and hike the trails or enjoy a public nature program. Year-round, work your way along the byways of Cortland County to find hidden caches and mini-treasures along the Experience Cortland GeoTour. After a long day outdoors, head to a brewery and relax, beer in hand. Cortland Beer Company & Farm Distillery actually has it all! Freshly brewed beer on tap, local NY wines, aged local whiskey and three different styles of vodka made from apples, grapes, and malt barely. Catch a local performance at the Center for the Arts in Homer, NY, or enjoy high-quality performances of the musical or non-musical variety at Cortland Repertory Theatre. You’ll love mouthing the words to favorites like Footloose or Newsies, or solving a who-dun-it murder mystery put on by a talented cast of local professionals. 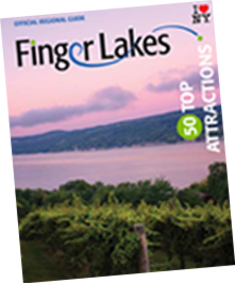 Summer or winter, the arts stop for no one in the Finger Lakes.